The ProForm Smart Strider 895 CSE is the top elliptical in the company's rear drive series, offering easy assembly, space saver design and plenty of workouts to keep you going. It's all new for the 2017 model year, along with base 495 CSE and mid-level 695 CSE. The 895 CSE features commercial gauge solid steel construction and oversized adjustable pedals with a a rear drive mechanism. It has a 7" full color HD touch display showing you all of your important workout stats as well as a built-in browser for surfing the internet. Early reviews of the 895 CSE have been very favorable, and despite its price tag it may well just turn out to be the most popular Smart Strider model of the three new 2017 rear-drive ellipticals. Why is that? Well it's the only one of the three to offer a touch screen display with built in internet...the base 495 CSE and mid-range 695 CSE feature the Round Watt LED display, which although is very nice, it doesn't compare to a touch screen. It also offers 32 built-in workouts, 24 resistance levels, Quick Touch controls, a higher max weight capacity of 325 lbs. and a stronger warranty than the other models. So of the three it's the best choice in our opinion. The 895 CSE also features the latest version of the company's iFit technology, now called iFit Coach. This is a membership program, currently about $144 per year ($12/month), that gives you access to endless trainer-designed workout programs, tracking and sharing capability so you can stay on top of your routines, personalized diets to keep you on track and best of all, Google map integration. When you read reviews you'll always notice that iFit is one of the most desirable features, as it creates an immersive experience that takes your workouts to new heights. As of this writing ProForm was offering a free iFit wearable with each membership so you can keep track of all of your efforts. Even without the freebie though iFit is well worth $12 a month in our opinion. Other great features: up to 10 degrees of incline, free heart rate chest strap included, easy storage, soft upper body grips, CoolAire workout fan, iPod music integration, transport wheels, leveling feet and a solid warranty. Any drawbacks? The 895 CSE, as well as the rest of the Smart Striders including the base 495 CSE, comes with a fixed 18" stride which may not be so comfortable for taller users. If you are on the taller side look at the Endurance or Pro Series...both offer longer stride lengths. If you are looking for an easy to assemble, easy to use elliptical with solid features at an affordable price, the 895 CSE is a very good choice. It has a folding design, incline capability, a nice touch screen, heart rate monitoring and plenty of programs. Of the three new CSE models this one is definitely the best choice, as it has a lot more to offer than those models do. However, if you are on the taller side the 18" stride might be to short for you, so take a look at the other models and choose one with a 20" or above. 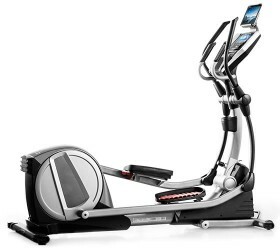 The ProForm 895 CSE elliptical is on sale right now!